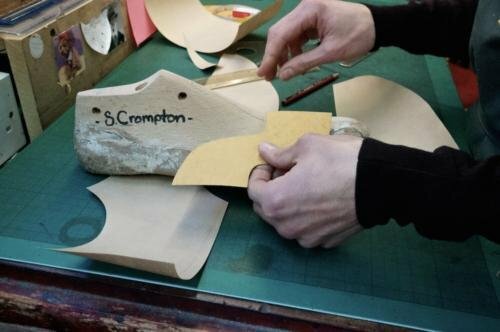 Emma (Lakin), at Foster & Son in London, is creating the pattern for my first pair of bespoke shoes with them – mid-brown Oxfords. Folding paper onto the last and marking it is the most popular method of doing this. One alternative, used in some shoe schools in the UK, is to cover the shoe in masking tape, draw the design on top, and then carefully cut the tape off. This is quite fiddly, however, and also has the problem of squashing that three-dimensional model into a two-dimensional shape. With paper it’s the opposite way round – taking a 2D plane and moulding it around the 3D last. The centre line has already been marked on the last – where the centre of the laces will be. This is a judgment call in itself, as it has to find a middle ground between the natural, straight line down the middle of the foot and the angle of the toes. The brown paper is folded down this centre line, and the top and bottom of the laces marked on. Then it is folded round to the heel, and folded at the heel line which has also been marked on earlier. The pattern is cut down, and refined, before marking on the laces and the top edge of the shoe. I particularly love the old, flexi-ruler that Emma uses to create a curve for that last step. As with many improvised tools, it was cheap and functional, but is now irreplaceable. They don’t make quite the same rulers any more. In the images above and below you can see later steps in the pattern-making process. Above, Emma is using a template to give a rough idea of the angle of the brogue line. This is used to create the pattern for the front of the shoe, which is being combined with the two back halves of the shoe, below. 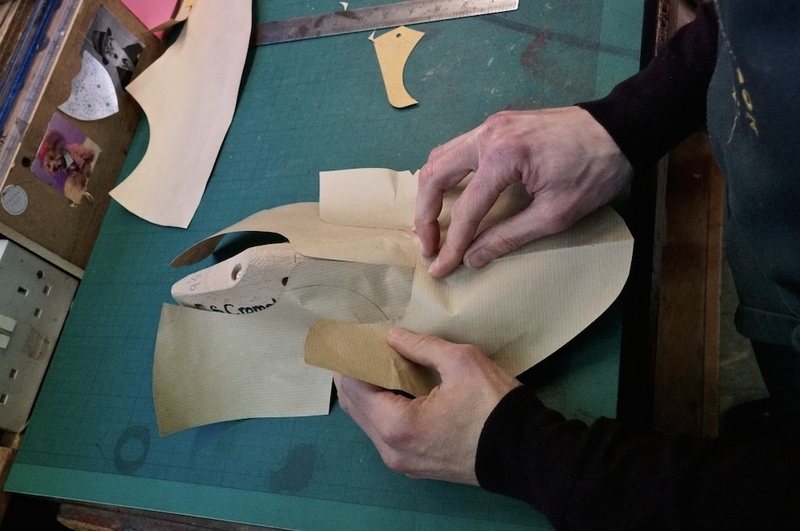 I am using this process of having my shoes made at Foster & Son to highlight areas not covered in my original series on shoemaking, at Cleverley. Next step in a couple of weeks. You can follow the discussion on Pattern making at Foster & Son by entering your email address in the box below. You will then receive an email every time a new comment is added. These will also contain a link to a page where you can stop the alerts, and remove all of your related data from the site. Always great to see craftsmen at work. Where on earth are you getting all if this money from to be buying bespoke shoes on top of the suits? Of course, your finances are none of my business but it does make one think that you are taking a lot of freebies from these people which calls into question your reviews of the products. As Ive said a lot, i do get discounts but usually not freebies. The discounts dont vary enough to make any difference to who i buy. And regardless, i have far too many clothes already. Im never going to wear something just because its free. Simon, do you know if there’s a difference between the upper leathers used on bespoke and top-end R-T-W (i.e. G&G, Weston, J.Lobb etc)? Obviously bespoke is cut by hand rather than laser-cut, but I mean the actual grade of leather. Not usually, no. It varies more by maker than by bespoke/RTW. Simon, whilst there are still hundreds of coat-makers and trouser-makers dotted around the West End, I’ve only ever met one bespoke shoes closer in 15 years! The question is, are they as scarce as they seem and do they tend to work for different firms? Secondly, have you never been tempted to try Anthony Delos’s bespoke for Berluti? High prices perhaps? Apologies, I was referring to lasting not closing. Used to be a gent in Dege’s old workshop in Clifford St. Can’t be that many guys around. Is it ok to wear soft and light, mid grey flannel trousers in the spring/summer without a jacket (blazer)? I am a student and therefore rarely wear jackets; I wear knitwear and/or polos or shirts of some kind most of the time, though. Sure, as long as youre not too hot. Also, flannel is nicest in decent weights (11oz+). Great, thank you so much. Talking about weight – do you have a recommendation on weight for all year around cotton trousers? I haven’t handled a Fosters shoe, but have enough experience of Northampton/English makers to have formed the opinion that Fosters shares if not stands alone at the pinnacle of bespoke makers, particularly for their asymmetrical ‘3-D’ upper designs and the apparent heft of their shoes, which I happen to like. Looking forward to seeing what they come u with for you Simon. yes the canvassess are all hand padded. Did they crib your last from J. Adler? That would be sick. Mine are ready for try on this spring. I too selected a mid-brown oxford, though I requested a dainite sole for wet weather.